Ripley's Believe or Not starred Robert Ripley himself as he explains the weird and strange stories from his travels around the world. Ripley's took his first trip around the world in 1922 and kept a sketch book and journal to chronicle all the unusual sites, customs, people, animals, and more. 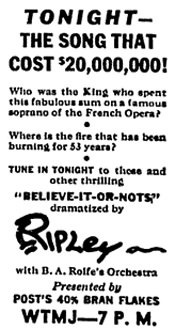 Ripley's Believe or Not radio show first went on the air in 1930 and the show drastically changed formats, time length, and sponsors until it ended in 1948. This collection of Ripley's Believe or Not radio show includes the 15 and 30 minute episodes. 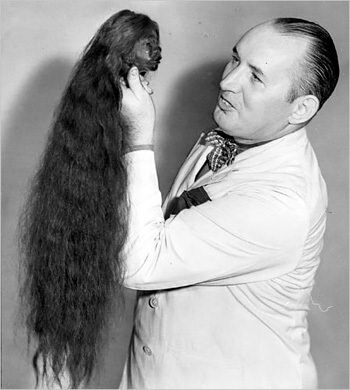 The radio show was able to fund Robert Ripley to go on more world travels and bring back weird world "facts" to delight audiences everywhere. Each show followed a theme such as beauty, South America, War Facts, Inventions, and even craziest people. The show also includes dramatic reenactments of stories and customs, comedy sketches, and music interludes. During part of the show's run, the music was provided by none other than Ozzie Nelson and His Orchestra with Harriet Hillard (later Harriet Nelson) performing vocals. See also: We the People, Ripley's One Minute Shorts, Strange As It Seems, and Incredible But True. Be the first to comment on "Ripley Believe It Or Not"